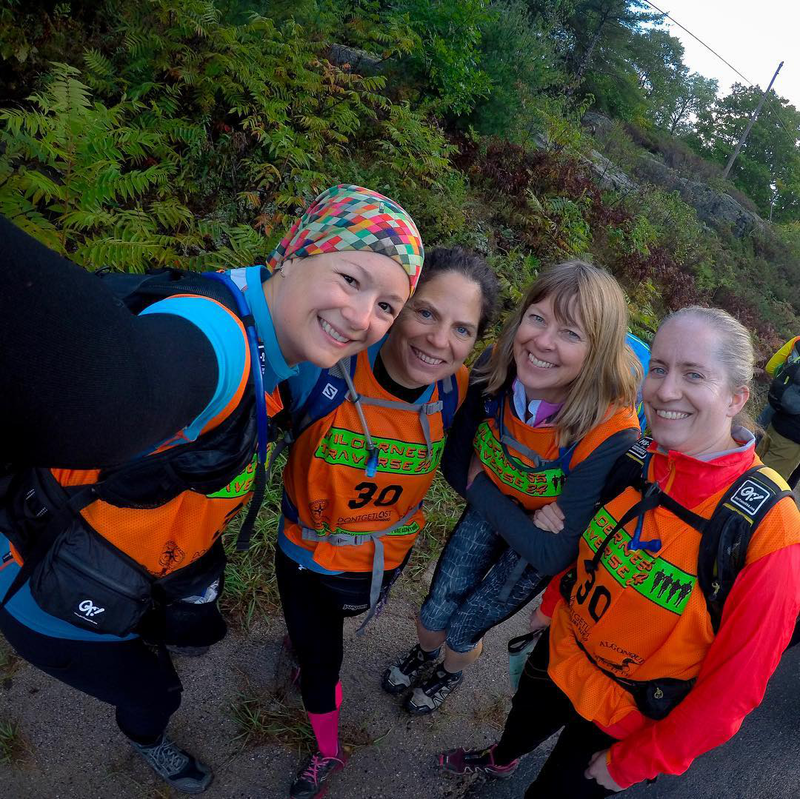 Hurray for our 2018 Wilderness Traverse team “Ready, Let’s Go, Run With Maps!” (Team #30). We finished Short Course A in 27 hours and 8 minutes. 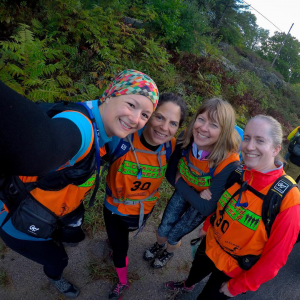 The team consisted of four women (Sarah, Erin, Stina, and Ilana), all who have participated in the Wilderness Traverse before but on different teams. Stina and Erin raced together on the same team in 2017. This leg took us around 6 hours and there were four checkpoints to find. Stina did a rock star job at navigating, and Erin counted paces (and is incredibly good at this!). There were a several route choices. Some involved wading through marshes and others involved several swims (the longest being approximately a 20 minute swim). We were one of the few teams who opted to stay dry and skipped the marshes and the swim. In the movie below, the orange line is the route the race coordinators took. Notice they swam through three lakes. Our icon veers off the orange line because we didn’t take that route. Below are some photos Erin took with a cool waterproof GoPro. We arrived at CP4 (check point 4) at 2:01pm. We snacked a bit (pizza!) and changed into our biking clothes. CP4 is where we found out that we had to finish the first part of the bike by 6:30pm. We needed to catch a ferry because the bridge was out, and the ferry stopped running at 6:30pm. This gave us 4.5 hours to travel approximately 30 kilometers. Cp4 to CP5 was challenging due to the water and mud on the ATV trails and power line trails. Most of the time we walked around the 8 ft long puddles because we deemed them too muddy to ride through. At times the water in the puddles was knee high on Sarah (our tallest team member), and almost thigh high on me (our shortest team member). I’m sure faster teams ran right through these mud puddles. We’d ride for a few minutes and then have to hike-a-bike, and repeated this over and over and over. Eventually we got to the last part of this demoralizing ride, at around 5:40pm and had little time to make it by the 6:30pm deadline. I didn’t think we were going to make it– but we got to CP5 at 6:10pm!!! Our time from CP4 to CP5 was 4 hours and 12 minutes. Yippie “Ready, Let’s Go, Run With Maps!” We made our first cut off time. We were all very happy to get there on time. The ferry ride was short and a bit on the chilly side. When we were dropped off at the other side, we had a quick snack. Two other teams were dropped off while we were snacking. Just when we got through part 1 of the mud slog there was more to be found– but this time is was in the dark. More ATV trails and power line trails and rocks and mud and water. Fun stuff!!! This time we all knew that we weren’t going to make it to CP6 by the 10:00pm cut off time. We were moving very slowly on the ATV trails. When we got to the power lines we rode through some of the puddles, but there was still plenty of hike-a-bike going on. This leg took us 6 hours and 55 minutes. When we got to the transition area we changed our clothes and tried to get warm. One of our teammates was very cold and couldn’t warm up. My guess is that she was in the beginning stages of hypothermia. Her husband, who was racing on another team and just arrived at the checkpoint before we did, was there to help her out. After changing her clothes, sitting under blankets, sipping hot chocolate, and placing hand-warmers on various body parts, she still wasn’t getting warm. The checkpoint folks started one of their cars, turned on the heated seats and blasted the heat and she sat in the car for a while. While she was warming up, her three other teammates nodded off while sitting on chairs. It was actually a nice break. We hung out at CP6 for around two hours. Our teammate emerged from the warm car and we all chatted about our options (e.g, continue onto the short course or quit and not finish the race). It was chilly at the check point (around 6C/43F), and one of our concerns was staying warm during the night time paddle. Consensus was reached and we decided to continue on! Hurrah for “Ready, Let’s Go, Run With Maps!” on their decision to forge ahead. For this leg Erin and Stina paddled together (Stina was still navigating), and Sarah and Ilana paddle together. 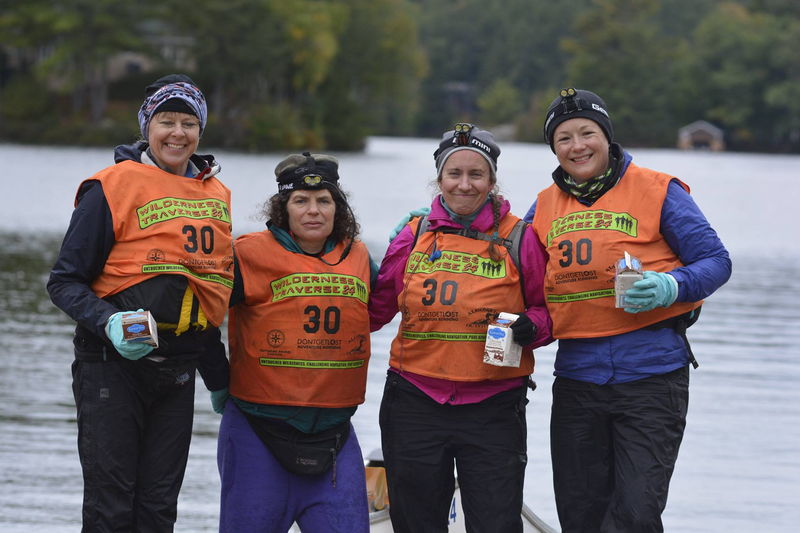 Team “Purple Haze” left the checkpoint at the same time, and we were paddling with them for most the trip. At some point during one of the portages (I think it was the 1000m) we came upon other teams. Where did these teams come from? Were they taking nap breaks? Once on the water we were grouped together (at least 4 teams). We were in the lead until the Inappropriate Portage. The last portage was supposed to be a 400m portage, marked with pink flagging. By now it was light out. 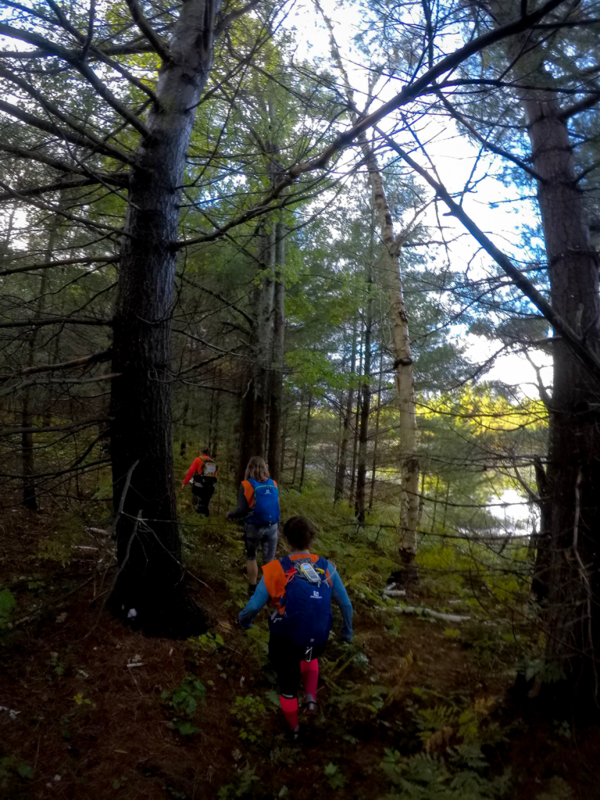 I’m not exactly sure what happened, but we followed another team and were not on a portage trail. Instead, we were bushwhacking with canoes up steep hills and over big logs– hence the Inappropriate Portage. Another team went ahead to scout the situation. 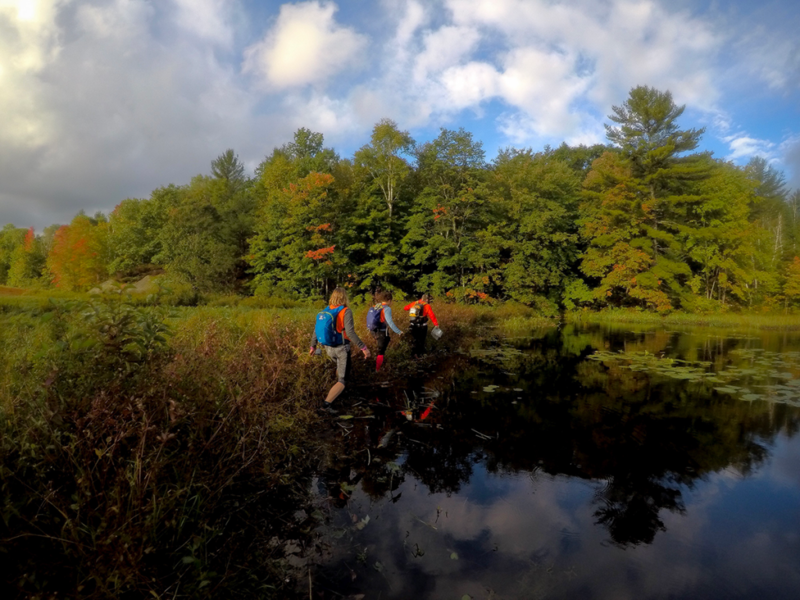 Eventually three of the four teams turned around to find the correct portage. We were the last of the three teams to make it back down to the water. We found the right portage trail, which had some interesting rocky parts at the end, brought our boats and gear over, and were off! Note, since we ended up completing Short Course A, our route in the movie below doesn’t follow the blue line (which is the direction of travel for the Full Course). We paddled and paddled some more until we got to the finish line at 11:08am Sunday, Sept. 30th. 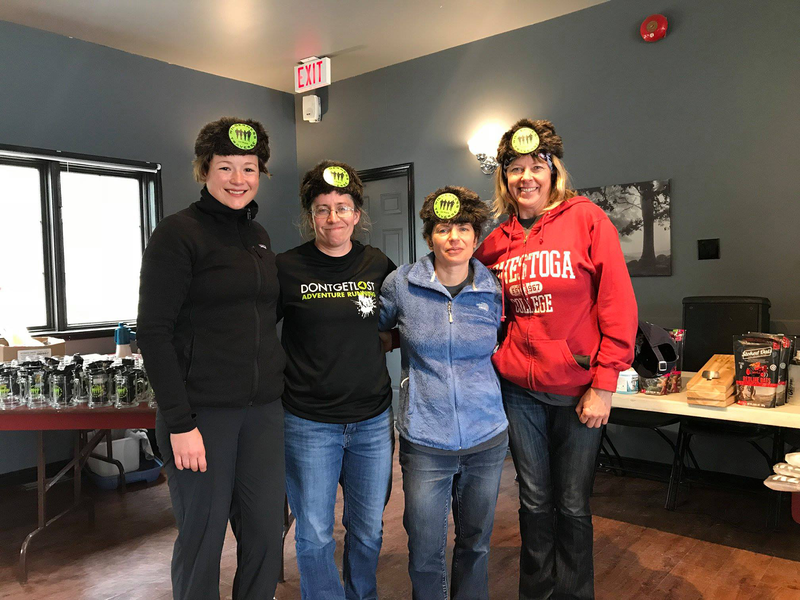 Out of the two all women teams participating in Wilderness Traverse 2018, we came in first. Except for my 15 year old rain pants that wouldn’t stay up, my gear was great. My new Trek Women’s Procaliber 6 (2018 model), held up well. Two weeks before the race I switched from clipless pedals to spiky flat pedals, and this was an excellent decision. There’s no way I could have biked the ATV trails in clipless pedals. Due to being cold on last year’s (2017) WT, I fluffed up for the bike ride– (bike shorts over my running capri’s and long socks, a long sleeve synthetic shirt over my short sleeve synthetic shirt, and a lightweight fleece vest). At first was too warm, but then just right. I was a bit cold on the ferry ride, but once we started moving again I was fine, especially once night fell. Once again, my nutrition was lacking. This is something I really need to work on. Basically I ate, Pringles, JuJubes, Oreo Cookies, a Larabar or two, and a slice of pizza. This is not nutritionally adequate, and I felt like I overdosed on sugar and salt. Next year I will consider bringing Samosas. Fantastic !!! I wish I could have done that kind of stuff. My big adventure was Boy Scouts and some white water rafting. Very proud of you. But in the pictures you are not smiling. You should smile you are great.